Cannabis has found its way into just about every facet of culture and lifestyle from food and fashion to medicine and spirituality and beyond. With so much happening in the weed world, sometimes you need more than an article or think piece to really get some in-depth understanding and keep your finger on the pulse of what’s going on in the industry. Thankfully, there are some books coming out this year that not only look interesting, but promise to give you better insight and new perspectives on cannabis whether you’re cooking in the kitchen or finding peace in the lotus position. If you’re trying to up your #shelfie game and keep yourself up to date on the latest in cannabis, put these books on your “to-read list” and get ready to learn something new. In this book examining what the future of cannabis cultivation could look like, Associate Professor Ryan Stoa makes a compelling case in favor of an industry that embraces artisanal, locally-produced cannabis in a model that looks more like the craft beer industry and less like mass-produced products. Growers, activists, politicians and others all weigh in on the potential environmental impacts and give insight into how small farms can be the key to sustainable marijuana agriculture. 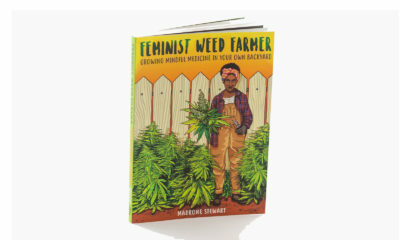 People that are into the art of cannabis cultivation will appreciate this book that imagines what’s to come and how to build systems to shape a greener industry. Whether you’re a beginner or a pro in the kitchen, there’s a dish designed to fit every skill level in this collection of 30 recipes. Stephanie Hua, the founder of gourmet cannabis-infused marshmallows brand Mellows, and executive chef Coreen Carroll collaborated on these low-dose recipes and made sure to include much-needed information on dosage and portions so people can confidently create and enjoy their homemade treats. Feel like there are some gaps in your marijuana knowledge? This informational collection of facts, tidbits and tips is a good place to start for people who want brush up on their cannabis 101. Award-winning journalist Amanda Sibert talks to medical professionals, researchers and experts in the industry to get the answers to questions about how cannabis can improve the quality of our lives from getting better sleep to helping ease the discomfort of medical conditions. For people who are interested in exploring new ways to bring their lifestyles together, author and teacher Will Johnson shares some practical ways to combine cannabis and spirituality through intentional breathing, sitting and gazing meditation and sacred movements like yoga or ecstatic dance as found in some Eastern traditions. Readers are given suggestions and exercises to enhance their spiritual practice and use marijuana to expand their consciousness and awareness. It’s a relatively short read that includes background on Shiva, quotes from Rumi and information about energy healing. Fans of the Viceland show should already know what to expect from a book inspired by this whimsical yet educational series that features high-end culinary dishes infused with all forms of cannabis. There’s everything from desserts to entrees and cocktails in this collection featuring 65 recipes. Learn how to infuse everything from butter and oils to alcohol and milk that can be used with their recipes in the book or put into your own creations.